The Humboldt squid (Dosidicus gigas), also known as jumbo squid, jumbo flying squid, pota, or diablo rojo (red devil), is a large, predatory squid living in the waters of the Humboldt Current in the eastern Pacific Ocean. It is the only species of the genus Dosidicus of the subfamily Ommastrephinae, family Ommastrephidae. Humboldt squid typically reach a mantle length of 1.5 m (4 ft 11 in). They have a reputation for aggression towards humans, though this behavior may possibly only be manifested during feeding times. Like other members of the subfamily Ommastrephinae, they possess bioluminescent photophores and are capable of quickly changing body coloration (metachrosis). They notably rapidly flash red and white while hunting, earning them the name diablo rojo (Spanish for "red devil") among fishermen. These chromatophores (which belong to more than one set and are of different sizes) may rapidly cycle through colors other than red and white, flashing too quickly for the human eye to see the transitions. They have a relatively short lifespan of just 1-2 years. They are most commonly found at depths of 200 to 700 m (660 to 2,300 ft), from Tierra del Fuego to California. This species is spreading north into the waters of Oregon, Washington, British Columbia, and Alaska. They are fished commercially, predominantly in Mexico and Peru. The genus contains bioluminescent species. Some squid may grow to 2.5 m (8 ft 2 in) in mantle length and weigh up to 50 kg (100 lb). Generally, the mantle (or body) constitutes about 40% of the animal's mass, the fins (or wings) about 12%, the arms and tentacles about 14%, the outer skin about 3%, the head (including eyes and beak) about 5%, with the balance (26%) made up of the inner organs. Humboldt squid are carnivorous marine invertebrates that move in shoals of up to 1,200 individuals. They swim at speeds up to 24 km/h (15 mph; 13 kn) propelled by water ejected through a hyponome (siphon) and by two triangular fins. Their tentacles bear 100–200 suckers, each lined with razor-sharp teeth, with which they grasp prey and drag it towards a large, sharp beak. Although Humboldt squid have a reputation of being aggressive towards humans, some disagreement exists on this subject. Research suggests these squid are only aggressive while feeding; at other times, they are quite passive. Their behavior while feeding often extends to cannibalism and they have been seen to readily attack injured or vulnerable squid of their own shoal. A quarter of squid stomachs analyzed contained remains of other squid. This behavior may account for a large proportion of their rapid growth. Some scientists claim the only reports of aggression towards humans have occurred when reflective diving gear or flashing lights have been present as a provocation. Roger Uzun, a veteran scuba diver and amateur underwater videographer who swam with a swarm of the animals for about 20 minutes, said they seemed to be more curious than aggressive. In circumstances where these animals are not feeding or being hunted, they exhibit curious and intelligent behavior..
Electronic tagging has shown Humboldt squid undergo diel vertical migrations, which bring them closer to the surface from dusk to dawn. Humboldt squid are thought to have a lifespan of only about a year, although larger individuals may survive up to 2 years. A crittercam attached to two Humboldt squid revealed that they "flash talk" with each other by changing color in certain ways, and that they can disguise themselves by shifting the color patterns in other ways. What they are communicating to each other is unknown. Recent footage of shoals of these animals demonstrates a tendency to meet unfamiliar objects aggressively. Having risen to depths of 130–200 m (430–660 ft) below the surface to feed (up from their typical 700 m (2,300 ft) diving depth, beyond the range of human diving), they have attacked deep-sea cameras and rendered them inoperable. Humboldt squid have also been observed engaging in swarm behavior when met by the lights of submersibles, suggesting that they may follow or are attracted to light. Reports of recreational scuba divers being attacked by Humboldt squid have been confirmed. One particular diver, Scott Cassell, who has spent much of his career videotaping this species, has created body armor to protect against attacks. 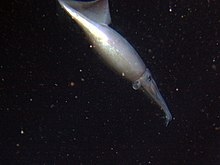 The Humboldt squid lives at depths of 200 to 700 m (660 to 2,300 ft) in the eastern Pacific (Chile, Peru), ranging from Tierra del Fuego north to California. It gets its name from the Humboldt Current, in which it lives, off the coast of South America. Recently, the squid have been appearing farther north, as far as British Columbia. They have also ventured into Puget Sound. Though they usually prefer deep water, between 1,000 and 1,500 squid washed up on the Long Beach Peninsula in southwest Washington in late 2004 and red algae were a speculated cause for the late 2012 beaching of an unspecified number of juvenile squid (average length 1.5 ft) at Monterey Bay over a 2-month period. The Humboldt squid's diet consists mainly of small fish, crustaceans, cephalopods, and copepods. The squid uses its barbed tentacle suckers to grab its prey and slices and tears the victim's flesh with its beak and radula. They often approach prey quickly with all 10 appendages extended forward in a cone-like shape. Upon reaching striking distance, they open their eight swimming and grasping arms, and extend two long tentacles covered in sharp 'teeth', grabbing their prey and pulling it back towards a parrot-like beak, which can easily cause serious lacerations to human flesh. These two longer tentacles can reach full length, grab prey, and retract so fast that almost the entire event happens in one frame of a normal-speed video camera. Each of the squid's suckers is ringed with sharp teeth, and the beak can tear flesh, although they are believed to lack the jaw strength to crack heavy bone. Another method of hunting is pulling the prey to great depths until it faints. The Humboldt squid is also known to quickly devour larger prey when hunting in groups. Until recently, claims of cooperative or coordinated hunting in D. gigas were considered unconfirmed and without scientific merit. However, research conducted between 2007 and 2011, published in June 2012, indicates this species does engage in cooperative hunting. Scientists suspect the recent expansion of the squid's range north along the West Coast of the U.S. is the result of overfishing of longer-lived apex predators. Commercially, this species has been caught to serve the European community market (mainly Spain, Italy, France, and Ireland), Russia, China, Japan, Southeast Asia, and increasingly North and South American markets. Fishers catch squid at night. Lights from the fishing boats reflect brightly on the plankton, which lure the squid to the surface to feed. Since the 1990s, the most important areas for landings of Humboldt squid are Chile, Mexico, and Peru (122–297, 53–66, and 291–435 thousand tonnes, respectively, in the period 2005–2007). Humboldt squid are known for their speed in feasting on hooked fish, sharks, and squid, even from their own species and shoal. Numerous accounts have the squid attacking fishermen and divers in the area. Their coloring and aggressive reputation have earned them the nickname diablos rojos (red devils) from fishermen off the coast of Mexico, as they flash red and white when struggling with the fishermen. Humboldt squid are generally found in the warm Pacific waters off the Mexican coast; studies published in the early 2000s indicated an increase in northern migration. The large 1997–98 El Niño event triggered the first sightings of Humboldt squid in Monterey Bay. Then, during the minor El Niño event of 2002, they returned to Monterey Bay in higher numbers and have been seen there year-round since then. Similar trends have been shown off the coasts of Washington, Oregon, and even Alaska, although no year-round Humboldt squid populations are in these locations. This change in migration is suggested to be due to warming waters during El Niño events, but other factors, such as a decrease in upper trophic level predators that would compete with the squid for food, could be impacting the migration shift, as well. A 2008 study published in the Proceedings of the National Academy of Sciences of the United States of America predicts that by the end of the 21st century, ocean acidification will lower the Humboldt squid's metabolic rate by 31% and activity levels by 45%. This will lead the squid to have to retreat to shallower waters, where they can take up oxygen at higher rates. In 2009, the Humboldt squid was featured in the final episode of the BBC's Last Chance to See, with Stephen Fry and Mark Carwardine. The episode was about blue whales, but the presenters interviewed fishermen who talked about the exploding diablo rojo population in the Sea of Cortez and human attacks, and showed a squid trying to take a bite of a protectively clad forearm. In 2016, the Humboldt squid featured in three television shows. 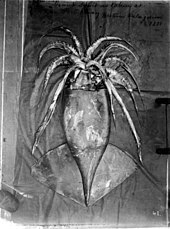 The first, Man Eating Super Squid: A Monster Invasion, premiered on the National Geographic Wild channel and explored various attacks by Humboldt squid in Mexico. In the show, the Humboldt squid is referred to as a real-life kraken and as "a global threat". The second show to feature the Humboldt squid recently is River Monsters: Devil of the Deep, where angler and TV show host Jeremy Wade sets off to the Sea of Cortez to investigate strange attacks on fishermen. Jeremy discovers that the fishermen were in fact attacked by Humboldt squid and that the Humboldt squid have now moved on from the Sea of Cortez south towards the coast of Peru. After joining a local fishing crew, Jeremy Wade catches multiple Humboldt squid off the coast of Peru. In Fishing Impossible shown on British TV in 2016, the team travel 10 hours out into the Pacific Ocean and put on diving suits reinforced with chain mail to protect themselves, as they plan to capture a Humboldt squid by hand. However, bad weather prevents them from diving for the squid. In 2016, Humboldt squid were featured on BBC Earth's Blue Planet II where the Humboldt's cannibalistic pack hunting was captured on film for the first time. ^ Barratt, I. & Allcock, L. (2014). "Dosidicus gigas". The IUCN Red List of Threatened Species. 2014: e.T162959A958088. doi:10.2305/IUCN.UK.2014-1.RLTS.T162959A958088.en. Downloaded on 10 March 2018. ^ a b Julian Finn (2016). "Dosidicus gigas (d'Orbigny [in 1834–1847], 1835)". World Register of Marine Species. Flanders Marine Institute. Retrieved 10 March 2018. ^ "Humboldt squid Found in Pebble Beach (2003)". Sanctuary Integrated Monitoring Network. Archived from the original on 2012-05-07. Retrieved 2011-10-25. ^ a b Zeidberg, L.; Robinson, B.H. (2007). "Invasive range expansion by the Humboldt squid, Dosidicus gigas, in the eastern North Pacific". PNAS. 104 (31): 12948–12950. doi:10.1073/pnas.0702043104. PMC 1937572. PMID 17646649. ^ Herring, Peter J. (1987). "Systematic distribution of bioluminescence in living organisms". Journal of bioluminescence and chemiluminescence. 1 (3): 147–163. ^ Glaubrecht, M.; Salcedo-Vargas, M.A. (2004). "The Humboldt squid Dosidicus gigas (Orbigny, 1835) history of the Berlin specimen, with a reappraisal of other (bathy-)pelagic gigantic cephalopods (Mollusca, Ommastrephidae, Architeuthidae)". Zoosystematics and Evolution. 80 (1): 53–69. doi:10.1002/mmnz.20040800105. ^ Norman, M.D. 2000. Cephalopods: A World Guide. ConchBooks. ^ a b Nigmatullin, C.M. ; Nesis, K.N. ; Arkhipkin, A.I. (2001). "A review of the biology of the jumbo squid Dosidicus gigas (Cephalopoda: Ommastrephidae)". Fisheries Research. 54 (1): 9–19. doi:10.1016/S0165-7836(01)00371-X. ^ Life. Extraordinary Animals, Extreme Behaviour by BBC Books, Martha Holmes & Michael Gunton, 2009, ISBN 978 1846076428, pg 22. ^ a b The Curious Case of the Cannibal squid Archived 2007-02-09 at the Wayback Machine, Michael Tennesen, National Wildlife Magazine, Dec/Jan 2005, vol. 43 no. 1. ^ Zimmerman, Tim (December 2, 2010). "It's Hard Out Here for a Shrimp". Outside Online. Retrieved October 25, 2011. ^ Gilly, W.F., U. Markaida, C.H. Baxter, B.A. Block, A. Boustany, L. Zeidberg, K. Reisenbichler, B. Robison, G. Bazzino & C. Salinas 2006. "Vertical and horizontal migrations by the jumbo squid Dosidicus gigas revealed by electronic tagging" (PDF). Marine Ecology Progress Series 324: 1–17. ^ Jane J. Lee (21 January 2015). "Watch Jumbo Squid Speak by 'Flashing' Each Other". National Geographic. Retrieved 2 August 2017. ^ "Video: Giant squid attacks diver". 2.nbc13.com. July 17, 2009. Archived from the original on 8 March 2016. Retrieved October 25, 2011. ^ "Humboldt or Jumbo Squid Fact Sheet". Smithsonian National Zoological Park. Archived from the original on November 2, 2011. Retrieved October 25, 2011. ^ "Author Bio: Scott Cassell". deeperblue.net. ISSN 1469-865X. Archived from the original on January 18, 2010. Retrieved November 28, 2012. ^ Cassell, Scott (December 15, 2005). "Dancing with Demons". deeperblue.net. ISSN 1469-865X. Retrieved November 28, 2012. ^ a b Teuthis, Archie (June 1, 2011). "KRAKEN Day: Humboldts, They're Here to Stay and They're NOT Giant Squid". Deep Sea News. Retrieved September 20, 2012. ^ "Jumbo Flying Squid Pile Up On Calif. Beach". December 11, 2012. Retrieved December 27, 2012. ^ Helena Smith (June 5, 2012). "Coordinated Hunting in Red Devils". Deep Sea News. Archived from the original on June 6, 2012. Retrieved June 6, 2012. ^ Liu, B.; Chen, X.; Lu, H.; Chen, Y.; Qian, W. (2010). "Fishery biology of the jumbo flying squid Dosidicus gigas off the Exclusive Economic Zone of Chilean waters". Scientia Marina. 74 (4): 687–695. doi:10.3989/scimar.2010.74n4687. ^ Tennesen, Michael (December 1, 2004). "The Curious Case of the Cannibal Squid". National Wildlife Federation. Retrieved October 25, 2011. ^ Thomas, Pete (March 26, 2007). "Warning lights of the sea". Los Angeles Times. Retrieved October 25, 2011. ^ Floyd, Mark (June 13, 2008). "Scientists See Squid Attack Squid". LiveScience. Retrieved October 25, 2011. ^ Rosa, Rui; Seibel, Brad A. (2008). "Synergistic effects of climate-related variables suggest future physiological impairment in a top oceanic predator". PNAS. 105: 20776–0780. doi:10.1073/pnas.0806886105. PMC 2634909. PMID 19075232. ^ "Man Eating Super Squid: A Monster Invasion". Pink Ink. Retrieved 2 August 2017. ^ "River Monsters: Monster Sized Special". Pink Ink. Retrieved 2 August 2017. ^ "Fishing Impossible, Series 1 Episode 3". Archived from the original on 2016-10-12. Retrieved 2016-10-10. ^ Knapton, Sarah (2017-11-03). "Blue Planet II: giant cannibalistic squid filmed hunting in packs for first time". The Telegraph. ISSN 0307-1235. Retrieved 2019-04-01. Wikimedia Commons has media related to Humboldt squid. "CephBase: Humboldt squid". Archived from the original on 2005. This page was last edited on 1 April 2019, at 13:29 (UTC).